5 Years After Haiti's Earthquake, Where Did The $13.5 Billion Go? : Goats and Soda Governments and nonprofits have insisted on keeping control of their projects in Haiti. So projects have cost several times more than they should. And Haiti is a long way from "building back better." 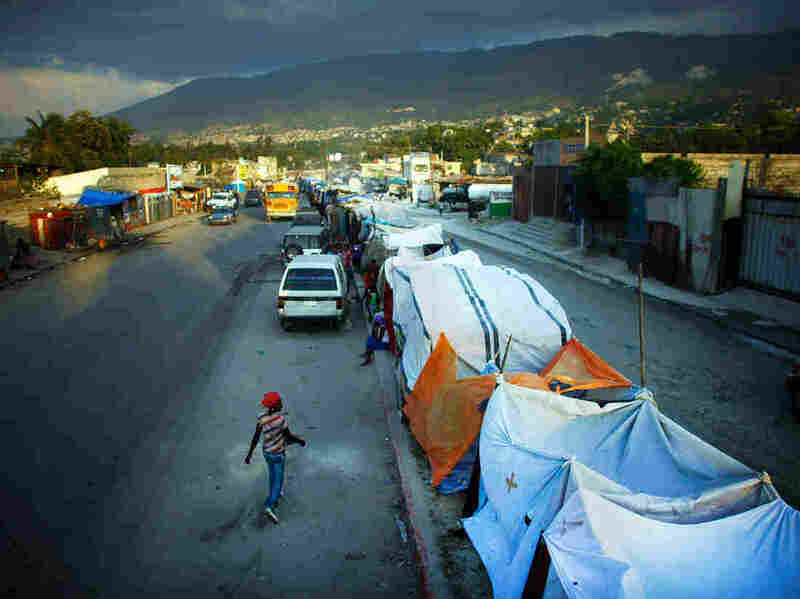 After the earthquake in 2010, about 1,000 people were living in tents on the median of Highway 2, one of Haiti's busiest roads. Five years later, tens of thousands of people in Port-au-Prince still live in tents and other temporary housing. Haitians protested in the streets of Port-au-Prince on Sunday, calling for the resignation of President Michel Martelly. "There have certainly been improvements," says Brian Concannon of the Institute for Justice and Democracy in Haiti, a nonprofit in Boston that fights for human rights on the island. "The rubble is off the streets. Haiti's back more or less to normal. But there have not been the improvements there should have been, given the resources." 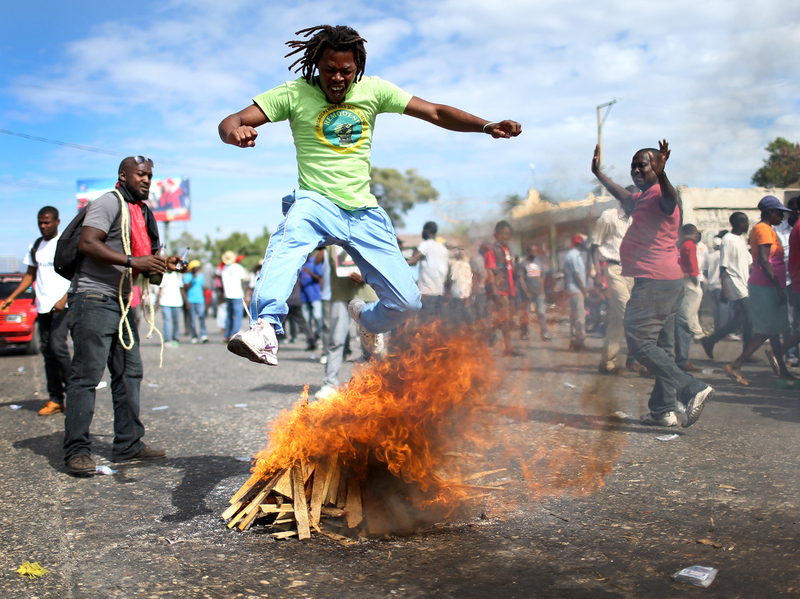 Unfortunately, "normal" in Haiti includes perpetual political turmoil. As NPR's Carrie Kahn reports, the earthquake's anniversary, on Jan. 12, is also the day when the terms of all but 10 senators expire, leaving President Michel Martelly in total charge of the government. A political impasse threatens to put legislative and local elections on hold for 39 months if a deal can't be reached by Monday evening. That kind of political morass is one big reason — though by no means the only one — why the billions in relief and recovery aid haven't been enough to rescue Haiti from the disasters that fate keeps flinging its way. The outside world's response to Haiti's continuing cholera epidemic offers a revealing window on this disheartening dynamic. Cholera was unknown in Haiti for the past century or more — until 10 months after the 2010 earthquake. Then it exploded along Haiti's largest river, the Artibonite, and spread quickly throughout the nation. The source is clear to public health experts: Cholera was brought to Haiti by Nepalese soldiers quartered in a United Nations peacekeeping camp that spilled its waste into a tributary of the Artibonite. 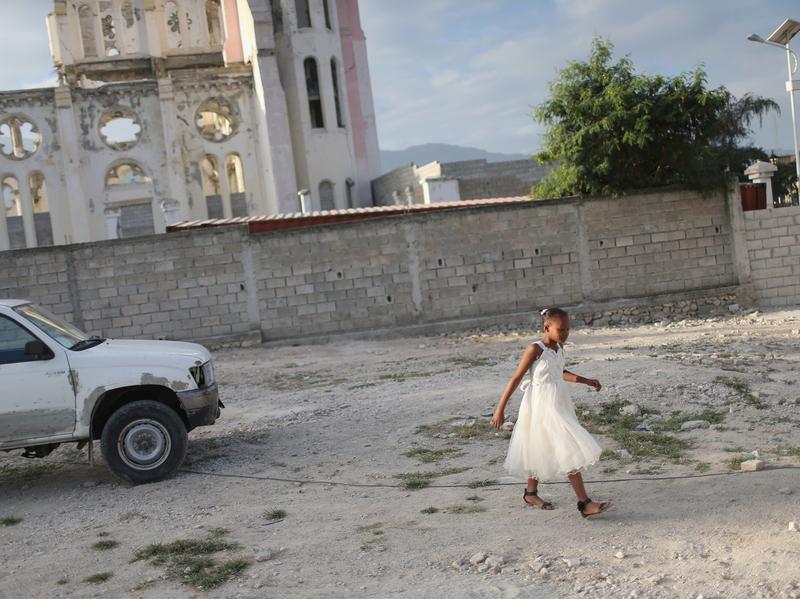 A child walks near the ruins of the National Cathedral in Port-au-Prince on Sunday. After the 2010 earthquake destroyed the cathedral, a new church was built next to the ruins. Over the past four years, cholera has struck more than 720,000 Haitians and killed almost 9,000. The U.N. has, so far, refused to acknowledge responsibility for the cholera catastrophe, but two years ago U.N. Secretary-General Ban Ki-moon launched a plan to eradicate the disease. The U.N. says the 10-year effort will cost $2.2 billion. That's less than the $2.5 billion the U.N. has spent on its Haitian peacekeeping mission since the outbreak of cholera. But over the past two years, the U.N. has persuaded member nations to pledge less than a fifth of the amount needed to eradicate cholera, a report from the U.N. Special Envoy to Haiti said this month. At current donation levels, it will take 40 years to eliminate the cholera in Haiti, says the U.N.'s own coordinator for the response in Haiti, Pedro Medrano. Members of a family look out from behind the tarp that serves as the front door to their home. The structure was built five years ago over the land where their home stood before the 2010 earthquake. 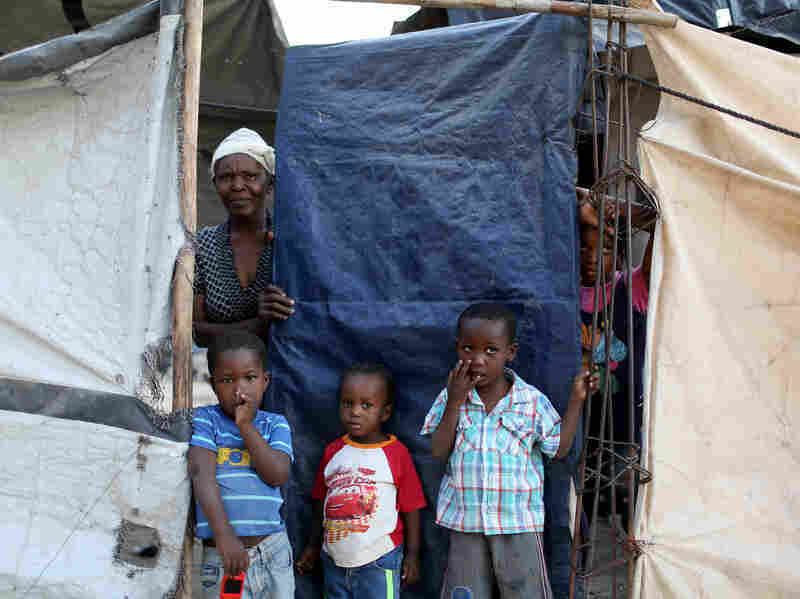 At one point, about 1.5 million people lived in tents across Haiti. Now about 80,000 people live in these structures. Lack of confidence in the Haitian government is one reason. The original plan was to set up a trust fund that would be controlled by the Haitian Ministries of Health and Environment. But that's not the way foreign aid to Haiti works. With few exceptions, donor nations and nongovernmental organizations insist on keeping control of their projects, which are set according to their own priorities. Jake Johnston of the Washington-based Center for Economic Policy and Research cites post-earthquake aid from the USAID, as an example. "USAID has spent about $1.5 billion since the earthquake," Johnston told Goats & Soda. "Less than a penny of every dollar goes directly to a Haitian organization." A growing reliance on U.S. and other international contractors helps explain why the payoff of foreign aid in Haiti often seems so low. For instance, it cost more than $33,000 to build a new housing unit in one post-earthquake program, a report from the U.S. Government Accountability Office said last year. That's five times more than one nonprofit, called Mission of Hope, spends per house, using local contractors. "International companies had to fly in, rent hotels and cars, and spend USAID allowances for food and cost-of-living expenses," Johnston wrote in the Boston Review last year. So-called danger pay and hardship pay inflated salaries by more than 50 percent. Interestingly, the only part of the Haitian government that receives direct funding from the U.S. government, the Health Ministry, has racked up impressive post-earthquake gains in childhood vaccination rates and access to lifesaving HIV treatment. So far, however, the idea of setting up a trust fund to allow the Haitian government to eradicate cholera by providing clean water and sanitation has been a deal-killer among international donors. A 2013 donor conference on cholera eradication was scuttled because of resistance to the idea. Even after the trust fund was abandoned, a donor conference last October failed miserably to raise needed pledges. So as Haiti approaches the fifth anniversary of its cholera epidemic later this year, the main hope for eradication rests on political and legal pressure on the U.N. to come up with the money. In December, 77 U.S. congressmen sent a letter to Ban Ki-moon demanding that the U.N. "create a fair process to adjudicate the claims made by cholera victims that allows for remediation of the affected communities." Meanwhile, Haitian plaintiffs and their advocates suffered a setback on Friday in their legal attempt to hold the U.N. accountable for the cholera epidemic. U.S. District Court Judge J. Paul Oetken rejected a class-action lawsuit that seeks to compel the U.N. to compensate victims and fund cholera eradication. The U.N. and its agents are "absolutely immune from suit in this Court," Oetken ruled. "The court's decision implies that the U.N. can operate with impunity," said lawyer Beatrice Lindstrom of the Institute for Justice and Democracy in Haiti, which represents the plaintiffs. "We don't think that is the law, and we don't think the Court of Appeals will find that either." Concannon, executive director of the Institute, says the plaintiffs are prepared to take the case to the U.S. Supreme Court, a process that he estimates could take two years. "If we do get a final order that the U.N.'s immunity doesn't apply, we would expect the U.N. to put in clean water and sanitation and compensate the victims," Concannon says. A previous version of this story incorrectly dated the earthquake as being on Jan. 10, 2010. It was actually Jan. 12, 2010. Additionally, the Government Accountability Office was misidentified as the Government Accounting Office.